Photoshop's Unsharp Mask Filter is the most common way of sharpening an image. The term 'unsharp mask', a seeming contradiction, originates from the print industry and relates to the sharpening that can be given to an image by combining the effects of a sharp original and a lighter, softly focussed, unsharp version. The Smart Sharpen Filter, introduced with CS2, works slightly differently, and gives greater control. The problem with this technique is that it's complicated to use, gives mixed results based on even the smallest of tweaks, and is time consuming to get right. There are of course lots of other ways to sharpen images. My favourites tend to be LAB colour mode, and High Pass Filter. Both of these techniques have particular advantages. They are fast, give you lots of control, work well on good quality images, and in the case of the High Pass, use adjustment layers. Never heard of them? That's understandable - the High Pass filter is hidden under 'Other' in the Filters tab, and the LAB technique is rarely covered in manuals, although it's basically an extension of Unsharp Mask. Check out this link if you want to read more about how LAB mode sharpening works. In this post I want to concentrate on the High Pass. High Pass takes its name from an old darkroom technique and has two very big advantages. Firstly, it is non-destructive i.e. it uses an adjustment layer, so that edits can be removed and the original image remains untouched, and secondly, it only affects edges within your image, not groups of pixels or shapes. This gives you a tremendous amount of control over the final results and is ideal to make complex images really crisp, or to soften out areas of your image that need to look smooth or more subtle. To start off, you'll need open the image file, and then duplicate the background layer. In the duplicated layer, go the blending modes and select Overlay or Hard Light. Either option blasts up the contrast as if you were overexposing the image. This lets us see the edges better. Now go to Filters>Other>High Pass. This brings up a preveiw pane which shows a grayed out image, a little bit like an emboss effect. You can see the edges really well in the preview pane, and can adjust them using the slider accordingly to get the best effect. A value of between 3.0 and 7.0 usually does the trick, but feel free to experiment. In this case I chose 5.1. Now go to the Opacity control and drop the opacity by about 50% and hey presto - a subtle edge sharpen that can be removed, hidden, or adjusted. 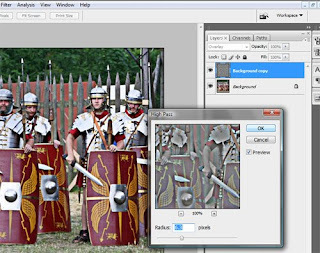 High Pass Sharpen is particularly good for hi-res images of people or objects with very definite edges and lines. You can also use High Pass to soften a photograph - say a person's skin - without softening the edges. The technique is exactly the same as above, but after selecting Overlay in the blending modes, you INVERT the duplicated layer, then drop the opacity. To tidy up, add a layer mask and remove any softening that has found it's way into edges or other detail. Cool or what. There is one important proviso - High Pass should only be used on high resolution TIFF images, or very good quality JPEG's. Once an image has been compressed, this sort of technique doesn't give good results.